During the toss, the RR skipper, Rahane revealed that they have made three changes to their squad, as Krishnappa Gowtham, Prashant Chopra, and Sudhesan Midhun made way for Sanju Samson, Riyan Parag and Jaydev Unadkat in their squad. On the other hand, CSK also made two changes as Harbhajan Singh and Scott Kuggelijn made way for Shardul Thakur and Mitchell Santner. Both the RR openers added as many as 31 runs for the first wicket off just 17 balls before Rahane getting out in the 3rd over by Deepak Chahar in a forced DRS call. On the penultimate delivery of the over. Rahane was looking to flick the length ball over the leg side, but as the ball stayed low it crashed straight into his knee flap in front of the middle stump. Chahar appealed for an LBW but the umpire didn’t give, even Dhoni wasn’t convinced but the bowler was completely convinced. However, Dhoni went for the DRS call but based on the TV timer, it’s a second late after the timer had hit zero. 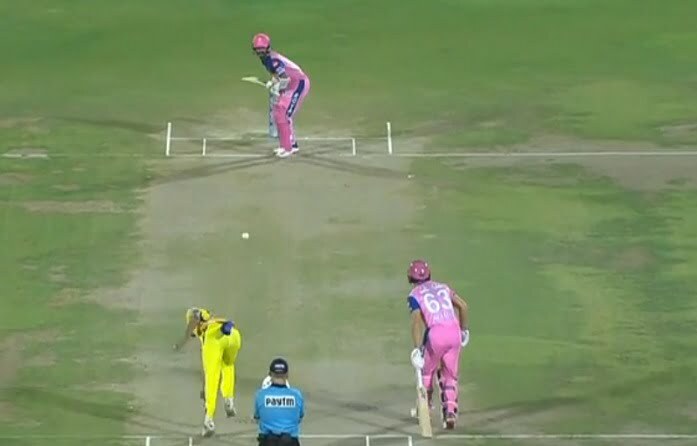 But it stands, say the umpires and CSK got the review right as well. Chahar had convinced to take the call and one has to say that it was a good call to review it.